Besides being a popular happy-hour spot, CJ Muggs also serves up a large variety of lunch and dinner options. Most any craving can be satisfied with selections including Bayou shrimp, nachos, meat loaf, risotto, vegetable pad Thai, burgers, pizzas (using both mozzarella and Provel) and an ample sandwich selection. 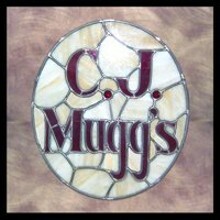 On nice days, guests can enjoy their meals on CJ Muggs' large patio.